For many families, Christmas has always been the season of spreading good cheer, quality family time, showing love and compassion to one another and of family bonding. The only time of the year when everybody, from your granny to your great uncle Jim, comes together to eat, drink and be merry. Surprisingly, there are people nowadays that do not spend Christmas with their families. This is indeed a sad reflection of our times. But more than this, it is a wake-up call for all of us who have been blessed with a good family and great kids, but are too busy with our professional lives to spend time with them. 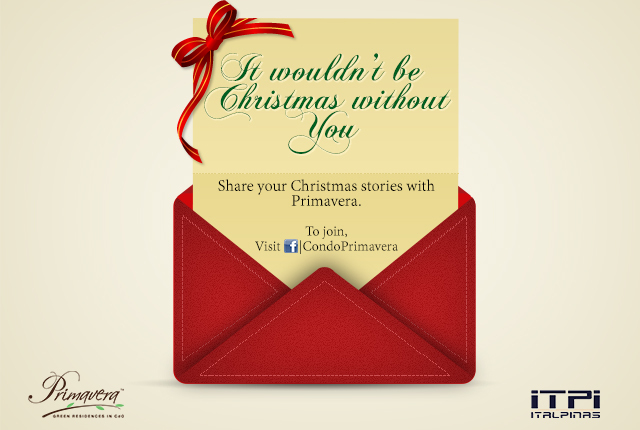 This December, as we celebrate the Christmas season, Primavera Residences invites you to come and join us as we give tribute to the people we want to be with on Christmas day. Starting on Wednesday, December 10 to December 26, we invite you to take a picture with the person you want to be with on Christmas day and write a story why your Christmas is not complete without him/her. The story must be in 5-10 sentences only. All qualified participants are given the chance to share their photos and garner likes. Winners will be determined through the highest number of likes. All photo sharing and garnering of likes will be up to December 26, 2014, 12mn only. There will be one lucky winner who will get a FREE OVERNIGHT STAY at a 1BR unit at Primavera Residences to complete your birthday wish to be with someone you love in the multi-awarded condominium in Cagayan de Oro. Primavera Residences is a twin-tower 10-storey eco-friendly building located at uptown Cagayan de Oro. It recently won as the Best Mixed-Use Development for the Philippines in the Asia Pacific Property Awards.